MANILA, Philippines - The November 2015 bar exam results will be released expected at 1:00 p.m. today, May 3, 2016 after the special en banc session of the Supre Court. The live updates and link to the full list of passers are available on this page. In the special en banc session, 'decoding of bar exam results' will be done. Decoding is the process where the SC orders the Office of the Bar Confidant to open the sealed envelopes with the names of the candidates who successfully passed the exams. 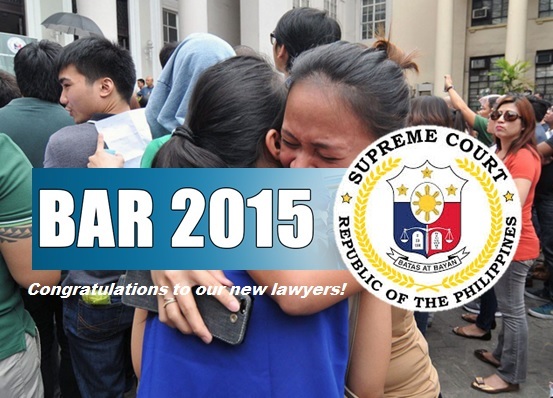 A total of 6,608 law graduates have completed the bar exams on four Sundays of November 2015 at the University of Santo Tomas, Espana, Manila. On Monday, reports have confirmed that SC has started preparations for the announcement of results. 10:43: SC's special en banc session is ongoing. 11:04: SC-Public Information Office has confirmed announcement of bar exam results after the press briefing at the SC Quadrangle at 1 p.m.
12:16: 26.21% of takers passed - source. Bar results now being decoded. 1:00: Bar results out online. Here's the live Twitter feed for those waiting for the results. Note: The full list of successful bar examinees will be flashed also on a widescreen at the SC front yard and simultaneously be viewed at the official website of the highest court. The Philippine Bar Examination is the professional licensure examination for lawyers in the Philippines and the only professional exam not handled by PRC.